The long, dark days of winter are coming to an end and the flowers are starting to bloom. Yes, spring is here at last. To celebrate, here’s another selection of the terrible MOT fails Britain’s MOT testers have found. Some of them are truly shocking and really show why the work they do is so important. Have you ever seen brake discs and pads in this condition? It’s a wonder how the owner didn’t notice that the brakes weren’t working properly. They were so bad there would have been little or no braking capacity whatsoever, which could have caused a crash. Luckily, thanks to the hard work of the MOT tester who found it, this car was taken off the road before any damage was done. 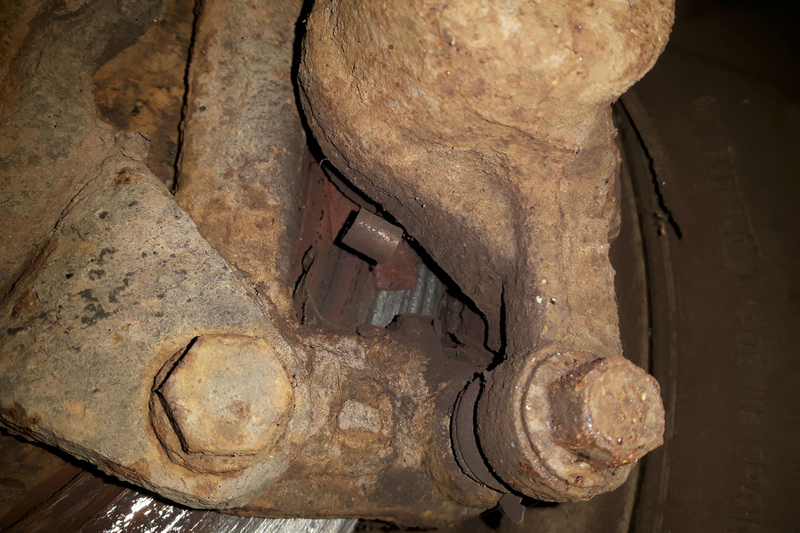 This bottom arm on a Morris 1000 had been ‘restored’ by a customer who then decided their car needed an MOT. Nick’s garage failed it on an amazing 26 points, including this one! That’s a lot of failures for one vehicle, and means there was no way it should have been on the road. Whoever had been fixing it clearly didn’t know what they were doing. Time to take it to an expert to fix it! 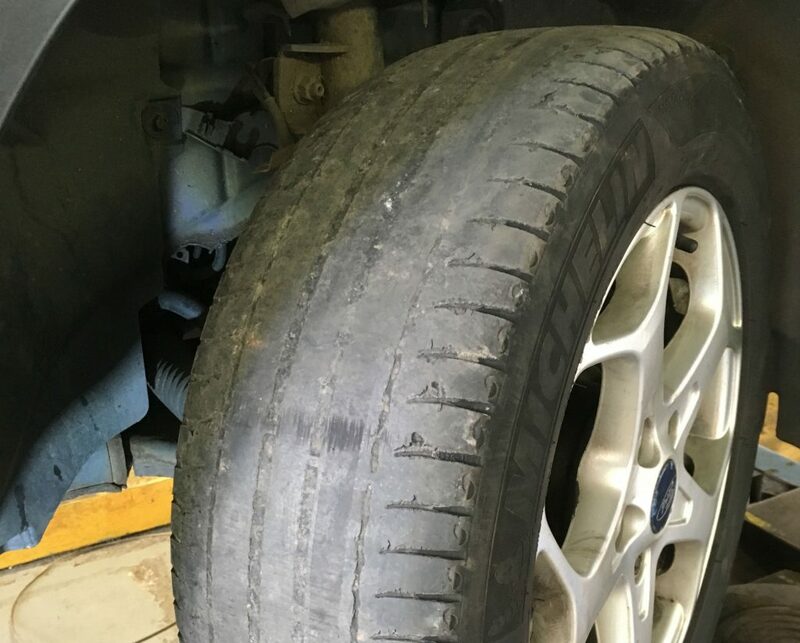 Matthew sent us this picture of a tyre on a 2009 Mondeo sent to his garage for test. With nearly no tread on this 8-year-old tyre, it’s surprising it could grip the road at all in the rain or wet! And he tells us the others weren’t much better! The law requires car tyres to have a minimum tread depth of 1.6mm in a continuous band around the central three quarters of the tyre. Manufacturers often mould tread bars on tyres to help judge the depth. You should make sure your tyres are safe and legal before you bring your car in for MOT. Not only will it make your vehicle more safe, it’ll save you the cost and wasted time of a failed MOT. Sam from a garage in Northampton sent us this photo of a 2005 Suzuki Alto. When it was being inspected with its front wheels jacked up, the hub assembly and damper fell apart due to being totally corroded away. 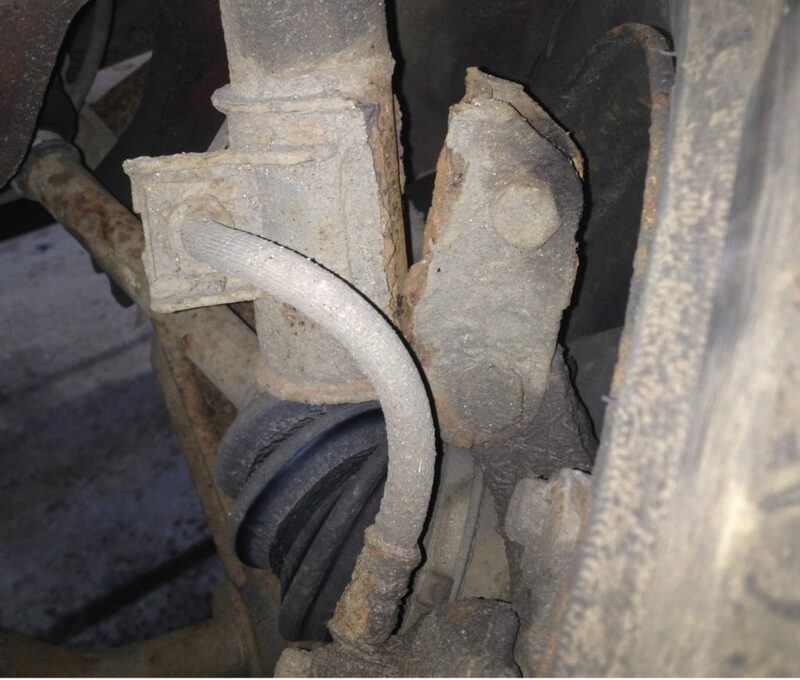 This shows the need for regular servicing and maintenance on your car. Of course, the majority of motorists do a great job of looking after their vehicles and don’t send them to the garage in the state these ones were. We’ll include the very worst ones in our next MOT horror stories blog post. A tyre like one pictured above i see almost on a daily basis! In the SN 02-2019 you state "Only fail a vehicle for missing heat shields if there's a risk of fire with other fuel system components.Only fail a vehicle for missing heat shields if there's a risk of fire with other fuel system components." However our local VE's have been saying that the manufacturer would not be fitting heat shields unless they needed to. So if a shield is missing it should fail ( As long as you are sure one was originally fitted). Also how can we know if there is a RISK of fire, is that only for heat shields around fuel tanks etc. why is it sometimes the mot certificate prints out 2 sheets of paper and on the second page it is completely blank apart from the VIN number and signature bit, what a waste of paper, does anyone else get this? You can find this year's topics here: https://www.gov.uk/mot-tester-training-assessments/training. We also sent an email alert out to MOT testers about this on 2 April 2019. You can sign up to get email alerts on the latest information from DVSA by clicking on 'Sign up for updates' from the home page of this blog. Great idea, Then when the owners take the vehicle to a different station who use the higher default setting this may eventually highlight an obvious cheat opportunity that needs investigating in my opinion. We’re exploring options for obtaining specific vehicle data from the various manufacturers. I would like to see headlamp levelling as a MINOR failure rather than a major one. Many drivers don't use it or even know of the controls and repairs often require expensive headlamp replacements and/or body control modules. Surely this is unnecessarily burdensome! You would ‘pass and advise’. Thanks for that Paul, found it, things get lost in all the chatter. Perhaps its time for a dedicated FAQ where things get answered quickly & easier to find rather then waiting for a response that might or might not get answered. It'll be interesting to see what the failure rate is on this item as I've had 4 in the past weeks that have failed & not cheap ones either where you can replace just the adjuster motor, its been whole headlights. also some clarification on what if one headlamp has been changed to a manually adjusted one as the motor has packed up ie screwdriver/allen key to adjust it & the other headlamp has the switch to adjust it still connected & working. When we log a car for test can you show us when the test is due. We only get to see when it was last tested and date of first use. Date mot is due would be helpful, if mot is overdue we can let customer know and help to make sure it dosnt happen again. One of the training firms which is on Facebook is telling every one this years training has to be done within 4 month or your RAG score drops down one level and if you have not done it by 8 months you may drop another level again . This will on work on tester who are green to start. Is this true. The comment you make refers to the quality inspection process during a site review for garages themselves. Poor management systems for training can affect a garage’s risk rating but this has nothing to do with the testers themselves. Where testers are concerned, we always advise that they do their training and assessment in good time and not leave it to the end of the year to do. Your recent clarification and flow chart regarding windscreen damage is nonsense! You say "Even the smallest amount of damage can cause problems" ie smaller than 10mm and fail, or larger than 10mm and pass. Similarly damage smaller than 40mm can fail , and larger than 40mm can pass! Your flow chart should be :- Is there damage> No > Pass. Is there damage> Yes >Does it significantly affect your view of the road > No > Pass. Yes> Fail...….. The 10mm & 40mm are totally superfluous!! Just to clarify for you, outline markers are not the ones down the side as these are side marker lamps - these provide visibility from the side. The ‘proper’ name for the lamps in question is ‘end-outline’ marker lamps, but this has been shortened to ‘outline marker’ lamp on MTS. There is no other lamp with ‘outline’ in its name. Okay fair enough, thanks for getting back to me. It would be much easier to follow / understand if the mot manual and mts are worded the same, so may i suggest when something is shortened on mts, can it also be shortened in the manual aswell please. The recent changes (last week) have LOST the mot expiry date from the vehicle information screen. Why is this? I found it a useful piece of info. Why does it not get included in the inspection sheet ? and why no vehicle colour on the inspection sheet? ...also , one of my testers uses a tablet and is complaining that you've changed layout to make it LANDSCAPE rather than PORTRAIT which he finds much more awkward to use!! We are looking into the items that have disappeared and will rectify as soon as we know why this has happened. so i'm guessing if there's a fault i.e sensors missing in wheels that's then classed as inoperative and a major? not malfunctioning which is a minor? I bought a car in early December 2018 with an MOT that was done in October 2018 and the only advisory was a near limit tyre on near side rear, when I took the car for service in late March I had a list of possible MOT failures that needed doing during the service to make the card road worthy I had to pay as much for repairs as I did for the car,I'm sure as was the manager of the garage that did my service the garage that did the MOT must have seen these problems and ignored them on behalf of the seller of the car,would it be possible to take the matter to a legal advisor. Is there any info on metal number plates? I have looked in the manual and testing guide and also on gov. but cant find anything . Any info on these type of plates would be great. call that tyre bald, it still has a hint of tread.my best was a skinny temp tyre used so long it was through to the cords the whole circumference of it! The number of times i hear metal on metal when people apply their brakes is growing. These, are quality cars, mainly BMWs and Mercs, but also other cars.people dont care or are just pure ignorant of these things. I'm going to have to post this here as you have closed the other pages to comments. why ? Why have you changed the layout of the failure/pass page, you've put all the needless information at the top & moved all the failure items to the bottom, I know what station is doing the test as I work here. The big Fail in red, yes is helpful but not the testing station info or my name, move all that down to the bottom ,otherwise I have to keep scrolling down to see what I've done. What a terrible condition to have a car on the road but even more frightening is the matter of not needing to take it back for a re test!! 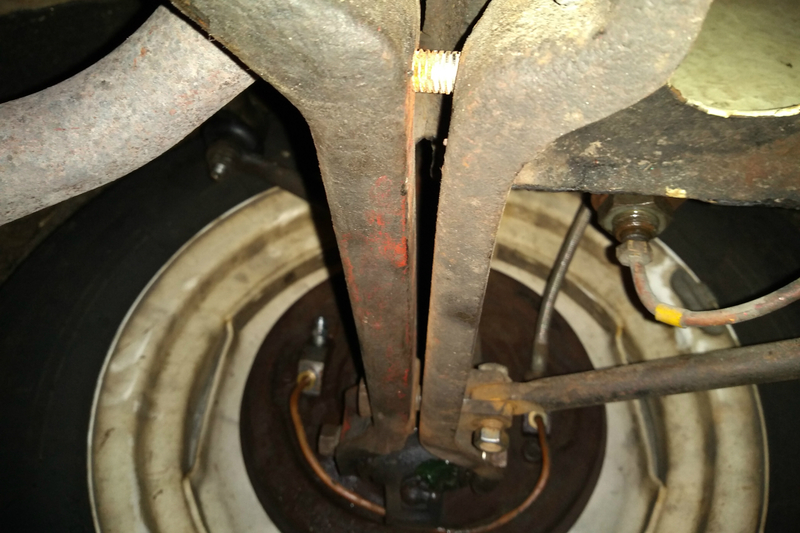 A DISC BRAKE ON A HGV MOT CAN HAVE HEAT CRAZING AND WORN PAST ITS LIMITS THE SUPPORTING SECTIONS SO CORRODED THEY CAN SHATTER BUT THATS A PASS SO LONG AS IT REACHES THE DTP TEST FIGURES. A lateral crack is the only fail!!!! THAT CAN RUN 44T +. The Suzuki Alto front suspension corrosion is the second one I have seen recently, I saw one in the local town which had obviously failed on the road as it had been dragged to the side. I wonder when that MOT was due, or done!!! I think it’s a great idea to publish photos of failure defects. Good feed back and just reinforces the work we the not testers do ,it all about having the car safety checked to the standards set out by our governing standards. And the government has got rid of the requirement for classic vehicles to have an MOT. Ridiculous. The pictures show that yearly MOT tests are vital as some people never have their cars serviced. We should also be thankful that the owner of the Morris 1000 decided to take his car for an MOT test even though DVSA and the government have decided that vehicles like this no longer need an MOT test!! The article tells us what a good job us testers are doing keeping dangerous cars off the road, yet the owner of this vehicle doesn't even need to bring it back for a re-test even though it failed on 26 items as I have asked this question before on here.